This article covers the history of science and technology in Mexico. The Royal and Pontifical University of Mexico, established in 1551, was a hub of intellectual and religious development in Mexico for over a century. During the Mexican Enlightenment, Mexico made rapid progress in science, but when the Mexican War of Independence came along, there was no scientific progress in Mexico. During the end of the 19th century, the process of industrialization began in Mexico, and it made significant progress in science and technology in the 20th century. During the 20th century, new universities and research institutes, such as the National Autonomous University of Mexico, were established in Mexico. According to the World Bank, Mexico is Latin America’s largest exporter of high-technology goods (High-technology exports are manufactured goods that involve high R&D intensity, such as in aerospace, computers, pharmaceuticals, scientific instruments, and electrical machinery) with $40.7 billion worth of high-technology goods exports in 2012. Mexican high-technology exports accounted for 17% of all manufactured goods in the country in 2012 according to the World Bank. The Caraol, Maya, Chichen Itza, Mexico, ca. 800-900 CE. El Caracol means “snail shell,” and this unusual round northern Maya structure encloses a circular staircase. The building may have been atemple to Kukulkan with an astronomical observatory at the summit. The Olmec, a Pre-Columbian civilization living in the tropical lowlands of south-central Mexico, calendar system required an advanced understanding of mathematics. The Olmec number system was based on 20 instead of decimal and used three symbols- a dot for one, a bar for five, and a shell-like symbol for zero. The concept of zero is one of the Olmecs’ greatest achievements. It permitted numbers to be written by position and allowed for complex calculations. Although the invention of zero is often attributed to the Mayans, it was originally conceived by the Olmecs. To predict planting and harvesting times, early peoples studied movements of the sun, stars, and planets. They used this information to make calendars. The Aztecs created two calendars one for farming and one for religion. The farming calendar let them know when to plant and to harvest crops. 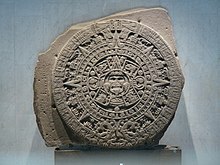 An Aztec calendar stone dug up in Mexico City in 1790 includes information about the months of the year and pictures the sun god at the center. The Aztec Sun Stone, also called the Aztec Calendar Stone, on display at the National Museum of Anthropology, Mexico City. After the Viceroyalty of New Spain was founded, the Spanish brought the scientific culture that dominated Spain to the Viceroyalty of New Spain. The Franciscan order founded the first school of higher learning in the Americas, the Colegio de Santa Cruz de Tlatelolco in 1536, at the site of an Aztec school. The municipal government (cabildo) of Mexico City formally requested the Spanish crown to establish a university in 1539. The Royal and Pontifical University of Mexico (Real y Pontificia Universidad de México) was established in 1551. The university was administered by the clergy and it was the official university of the empire. It provided quality education for the people, and it was a hub of intellectual and religious development in the region. It taught subjects such as physics and mathematics from the perspective of Aristotelian philosophy. Augustinian philosopher Alonso Gutiérrez in 1553 he became the first professor of the University of Mexico. He wrote Physica speculatio, America’s first scientific text, in 1557. By the late 18th century, the university had trained 1,162 doctors, 29,882 bachelors, and many lawyers. Educated by the Jesuits in Mexico Carlos de Sigüenza y Góngora displayed an astonishing proficiency in science and mathematics. During the late 17th century he won the chair of mathematics and astronomy at the University of Mexico. Sigüenza challenged the official doctrine that comets were divine portents ofdisaster and argued for their natural origin. He is considered the first scientist of colonial Mexico to question the scholasticism that permeated the university and most of society. Andrés Manuel del Río was the first person to isolate vanadium. During the Mexican Enlightenment, science can be divided into the four periods: the early period (from 1735 to 1767), the Creole period (from 1768 to 1788), the official or Spanish period (from 1789 to 1803) and the period of synthesis (from 1804 to the beginning of the Mexican independence movement in 1810). During the 16th and 17th centuries, modern science developed in Europe but it lagged behind in Mexico. The new ideas developed in science in Europe were not important in Mexico. The 1767 expulsion of Jesuits, who had introduced the new ideas in Mexico, helped to antagonize the Creoles and also promoted national feelings among Mexicans. After the expulsion, self-taught Creoles were the first scientists in Mexico. Later on, they were joined by the Spanish scientists, and they did research, teaching, publishing, and translating texts. The ideas of Francis Bacon and René Descartes were freely discussed at seminars, which caused scholasticism to lose strength. During the Mexican Enlightenment, Mexico made progress in science. Progress were made in subjects such as astronomy, engineering, etc. In 1792 the Seminary of Mining was established. Later it became College of Mining, in which the first modern physics laboratory in Mexico was established. Famous scientists of the Enlightenment included José Antonio de Alzate y Ramírez and Andrés Manuel del Río. Río discovered the chemical element vanadium in 1801. Manuel Mondragón, the designer of Mondragón rifle. The Mexican War of Independence brought an end to Mexico’s scientific progress. The Royal and Pontifical University of Mexico closed in 1833. For many years, there were no scientific activities in Mexico. The Royal and Pontifical University of Mexico was definitively shut down in 1865. During the end of the nineteenth century, the process of industrialization began in Mexico. Under the influence of positivists and scientific thinkers, the government assisted in public education. In 1867 Gabino Barreda, a student of Auguste Comte, was charged with the commission aimed at reforming education. Subjects such as physics, chemistry, and mathematics were included into the secondary school curriculum. National Preparatory School was established. The influence of positivists led to a renaissance of scientific activity in Mexico. General Manuel Mondragon, invented the first automatic rifle the Mondragón rifle during this time. The Engineer Eduardo Molina director of Mexicos city aqueduct. Mural by Diego Rivera. The Tlahuizcalpan building of the Faculty of Sciences of the National Autonomous University of Mexico. During the 20th century, Mexico made significant progress in science and technology. New universities and research institutes were established. The National Autonomous University of Mexico (Universidad Nacional Autónoma de México, UNAM) was officially established in 1910, and the university become one of the most important institutes of higher learning in Mexico. UNAM provides world class education in science, medicine, and engineering. Many scientific institutes and new institutes of higher learning, such as National Polytechnic Institute (founded in 1936), were established during the first half of the 20th century. Most of the new research institutes were created within UNAM. Twelve institutes were integrated into UNAM from 1929 to 1973. In the 1930s Manuel Sandoval Vallartaa Mexican physicist worked on Cosmic ray research and by the 1943 to 1946, he divided his time between MIT and UNAM as a full-time professor. On August 31, 1946, Guillermo González Camarena sent his first color transmission from his lab in the offices of The Mexican League of Radio Experiments, at Lucerna St. #1, in Mexico City. The video signal was transmitted at a frequency of 115 MHz. and the audio in the 40 meter band. González Camarena was a Mexican engineer who was the inventor of a color-wheel type of color television, and who also introduced color television to Mexico. Rodolfo Neri Vela is the first and only Mexican, and the second Latin-American to have traveled to space. In 1959, the Mexican Academy of Sciences (Academia Mexicana de Ciencias) was established as a non-governmental, non-profit organization of distinguished scientists. The Academy has grown in membership and influence, and it represents a strong voice of scientists from different fields, mainly in science policy. By 1960, science was institutionalized in Mexico. It was viewed as a legitimate endeavor by the Mexican society. In 1961, the Center for Research and Advanced Studies of the National Polytechnic Institute was established as a center for graduate studies in subjects such as biology, mathematics, and physics. In 1961, the institute began its graduate programs in physics and mathematics and schools of science were established in Mexican states of Puebla, San Luis Potosí, Monterrey, Veracruz, and Michoacán. The Academy for Scientific Research was established in 1968 and the National Council of Science and Technology was established in 1971. 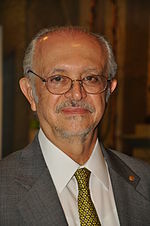 In 1995 Mario J. Molina became the first Mexican citizen to win the Nobel Prize in science. Ricardo Miledi, one of the ten most quoted neuro-biologists of all time, was born in Mexico, D.F. in 1927. His career in science began in 1955 when, just before graduating in Medicine at the Universidad Nacional Autónoma de Mexico (UNAM), he joined one of the most active research groups in his country, part of the Instituto Nacional de Cardiología (the National Institute of Cardiology). The AEM agency aims to coordinate the space activities that are performed in the country, such as those developed around the Large Millimeter Telescope in the state of Puebla. Many of Professor Miledi´s studies and breakthroughs in Neurobiology, especially those related to the mechanisms of synaptic and neuromuscular transmission, are considered to be classic throughout the world. Over 450 publications are the tangible product of forty years of research devoted in the main to the primary functions of the nervous system: the transmission of information between cells. He has been a member of the Royal Society of London since 1980, and entered the American Academy of Arts and Sciences in 1986. In 1999 Miledi was awarded with the Prince of Asturias Award for Technical and Scientific Research. He has been Professor of Biophysics at the University of London and distinguished professor of the University of California since 1984. He also leads a neurobiology laboratory in UNAM in Querétaro, México. In 1985 Rodolfo Neri Vela became the first Mexican citizen to enter space as part of the STS-61-B mission. In 1995 Mexican chemist Mario J. Molina shared the Nobel Prize in Chemistry with Paul J. Crutzen, and F. Sherwood Rowland for their work in atmospheric chemistry, particularly concerning the formation and decomposition of ozone. Molina, an alumnus of UNAM, became the first Mexican citizen to win the Nobel Prize in science. The Large Millimeter Telescope was inaugurated on 22 November 2006. It is the world’s largest and most sensitive single-aperture telescope in its frequency range, built for observing radio waves in the wavelengths from approximately 0.85 to 4 mm. Located on top of the Sierra Negra. It is a binational Mexican (70%) – American (30%) joint project. In 1962, the National Commission of Outer Space (Comisión Nacional del Espacio Exterior, CONNE) was established, but was dismantled in 1977. On July 30, 2010 the law to create the Agencia Espacial Mexicana (AEM) was published. It is now in the process of defining the National Space Policy and its program of activities. Robotics is a new area under development in Mexico, the Mexone Robot is one of the most advanced robot designs in the world. Austrade predicts Mexico’s IT spending will grow at a compound annual growth rate of 11 per cent over 2011-2015. Based on the information managed by Scopus, a bibliographic database for science, the Spanish web portal SCImago places Mexico at 28th in country scientific ranking with 82,792 publications, and 34th considering its value of 134 for the h-index. Both positions are computed for the period 1996-2007. The electronics industry of Mexico has grown enormously within the last decade. In 2007 Mexico surpassed South Korea as the second largest manufacturer of televisions, and in 2008 Mexico surpassed China, South Korea and Taiwan to become the largest producer of smartphones in the world. There are almost half a million (451,000) students enrolled in electronics engineering programs.